Ladies with brunette hair color frequently choose burgundy colors in hair dying, that is to say dark red or as people say "red wine" hair colors. Among blondes and ladies with brown hair color sometimes you can find those whose burgundy shades so as to look modern and add life to style, but in fact they become too bright. 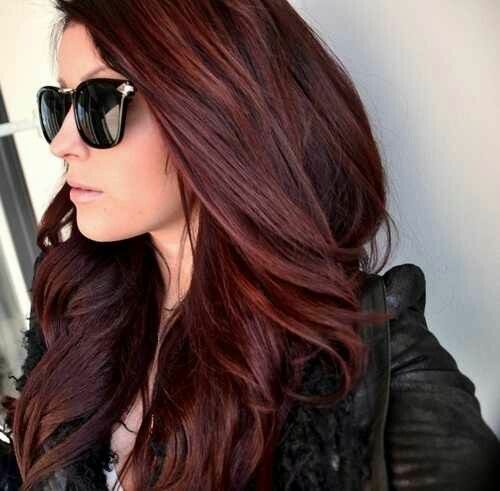 Redheads sometimes also go for warm wine colors and shades, mostly choosing cinnamon tones. So burgundy, maroon, deep red...all shades are expressive and feminine, the question is which one to choose. In this post the most adorable burgundy hair color examples are represented. Burgundy hair color inspires new breath and movement to your hair texture and style, with its undertones it looks very warm. Bolder shades will make a real statement as hair color trendsetter for you. With burgundy hair colors you can have a retro look, or party appearance with more vivid shades, or warm and homely with the warmest old burgundy hair color. Just go throgh the examples below and decide what you really want. At the very beginning burgundy hue was used mainly by brunettes, but nowadays as I said even blondes come to choose it to get the brightest images. If you are a blonde but you can't undertake such drastic changes, try ombre shades, purple tones using semi-permanent hair dye. It vanishes away after some 20 washings and you won't get tired of your constant vivid color. It is really worthy idea for brown hair color, or light brown and blonde colors. Vinous highlights are perfect darker hair, dark brown and even black hair color. So it's time to go through the pictures! On bleached hair or natural blonde vinous shades look vivid yet so pure. Rihanna has tried many shades of red, but this one is the softest and actually suits her much. This may remind more auburn hair color, but it's burgundy with cinnamon and orange highlights. It gretly fits girls with darker skin, they also seem to like to mix up some wine! You see classic burgundy with auburn highlights! Combined with black outfit these color look very stylish and in trends. If you have red hair color, try purple highlights like the hairstyle in the above picture. You will see that it such color combo looks gorgeous. I can't help saying that classy old burgundy hair color is meant for retro hairstyles. Look at this vintage wavy hair, combined with the purple coat she looks unforgettable. A very classy design here: deep burgundy color of the base changing into black and purple at the ends creating the marvellous atmosphere of mystery around your figure. Dark burgundy hair color looks very natural, it seems to add some gloss to your dark brown hair. Color looks very rich and suitable for almost all hair types.